Just Jingle: Life is a Beautiful Ride! Hello, friends! If you are reading this on the day it went up, well, you are reading as the entire contents of our home is being moved from one apartment to the other! Fun times! And a great reminder that life truly is a beautiful ride that brings us all kinds of new and interesting experiences! Our Simon Says Stamp Wednesday Challenge this week is a Color Inspiration challenge! 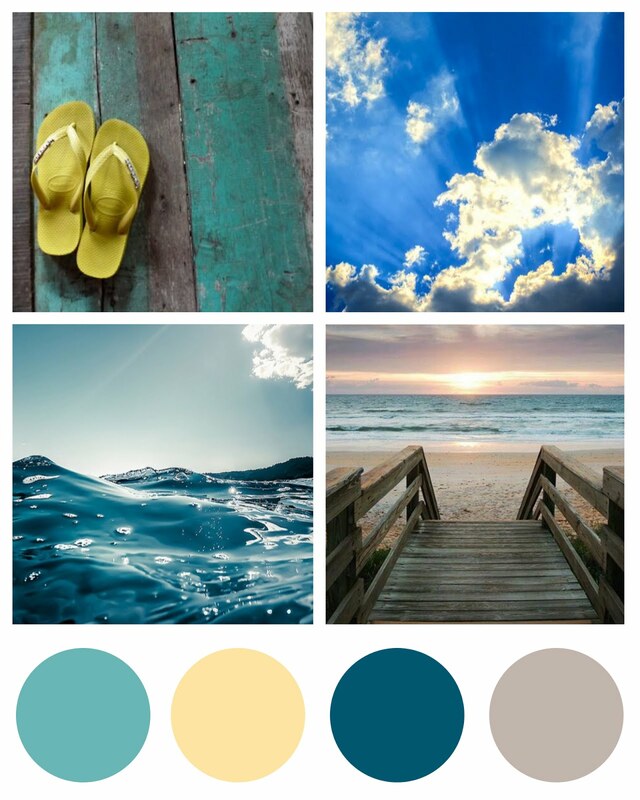 Check out this beautiful inspiration board! I am a water girl. I absolutely LOVE the ocean. And summer. And the beach. I so love it all! 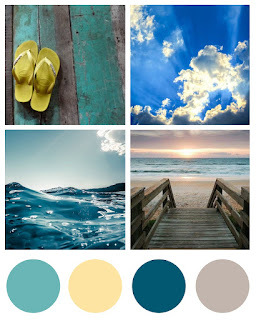 This inspiration board made me so happy! And I had a blast coming up with a card inspired by it! 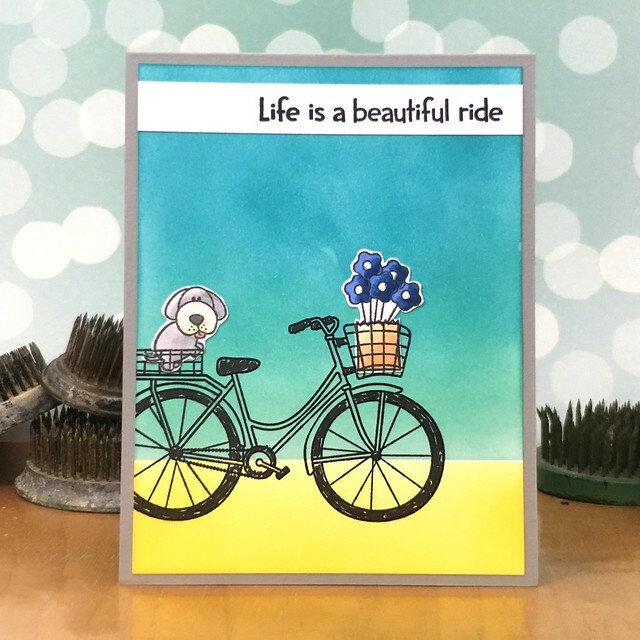 I used the Beautiful Ride stamp set from Simon Says Stamp, as it seemed a PERFECT fit for this photo! 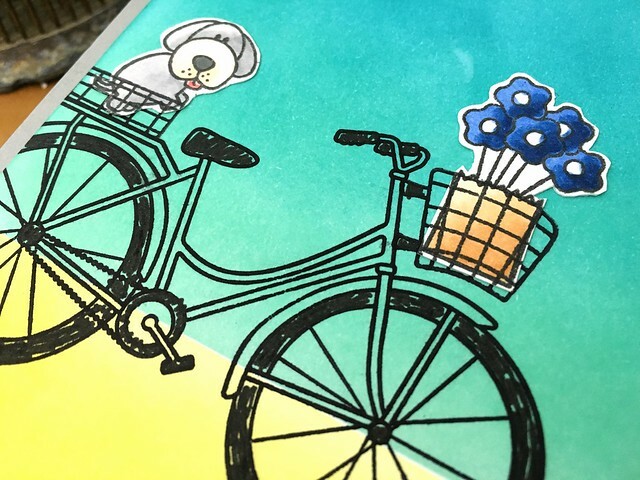 I did a lot of masking to create the background with Distress inks and then stamped the bike over it using Simon Says Stamp Intense Black ink. I used a black pen to fill in parts of the bike to keep it simple and give it a sketchy look. I then stamped and colored the puppy and used a bit more masking to add the flowers to the paper sack. I fussy cut these pieces and added them to the bike baskets. I LOVE how cute this turned out and the warm happy colors inspired by the inspiration photo make me happy! And now it's YOUR turn! Create something fabulous, inspired by the inspiration photo and link it up over on the Simon Says Stamp Wednesday Challenge blog for your chance to win a $100 Gift Certificate to the Simon Says Stamp Store! The Design Team is using Simon Says Exclusives this week, you don't have to use them to play along, but if you have some, we would SO love to see you rock them! Awesome card Jenn, love the background colours - so pretty. Love your blending of colors, Jennifer! What's more summer than a bike ride! I LOVE how you interpret the colors on the gorgeous bike scene! Beautifully done!!! Such a cute design, love it! Such a cute design, Jennifer!! Love the pup on the back!